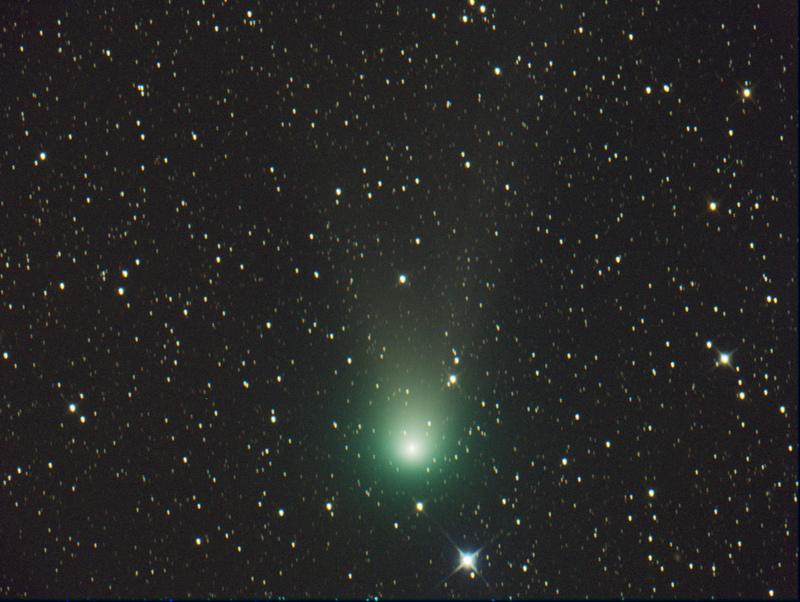 For this image I used my new modified Canon 5D MkII on the 40cm f/4 Newtonian. 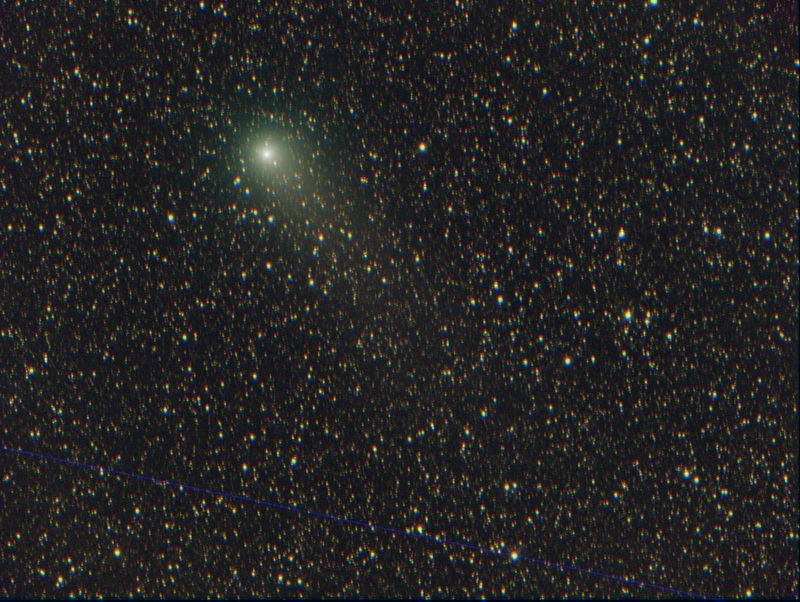 The fov of this full frame (24 x 36mm sensor is much bigger than with the QSI583 ( now 77 x 52 arc minutes, was 39 x 29 arc minutes) but still too small for this comet! 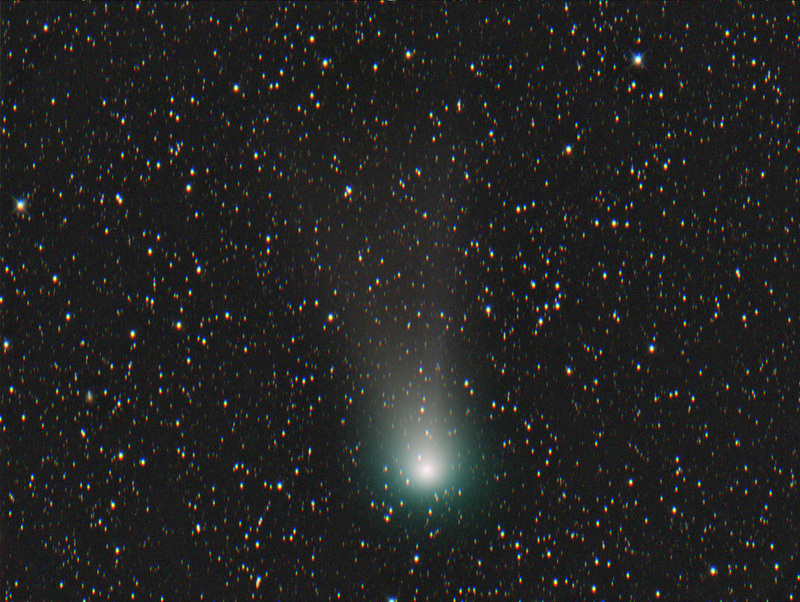 42 exposures of 60 seconds between February 2, 2012, 4:55 and 5:40 UT, @ 1000 ISO. 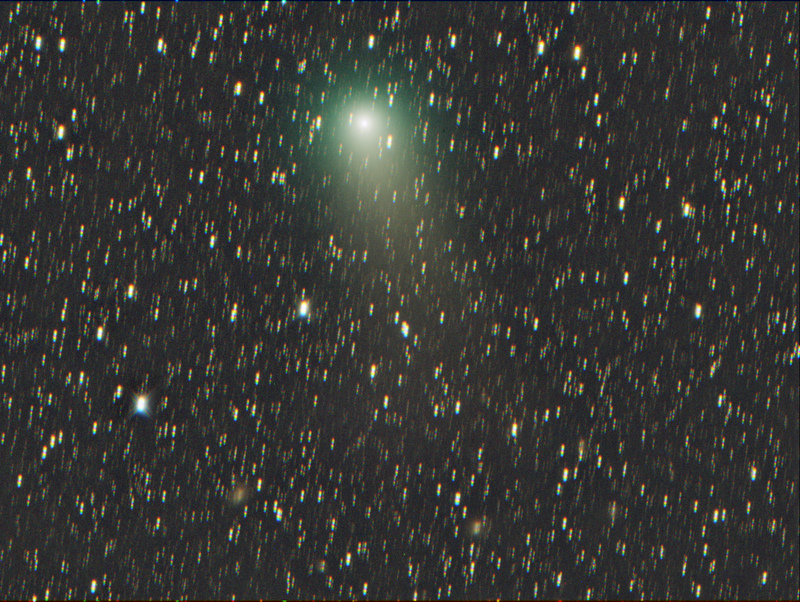 For comets a one shot colour camera is a big advantage! 12 x 3 minutes 40cm f/4 newton, QSI583wsg in binning 2x2. 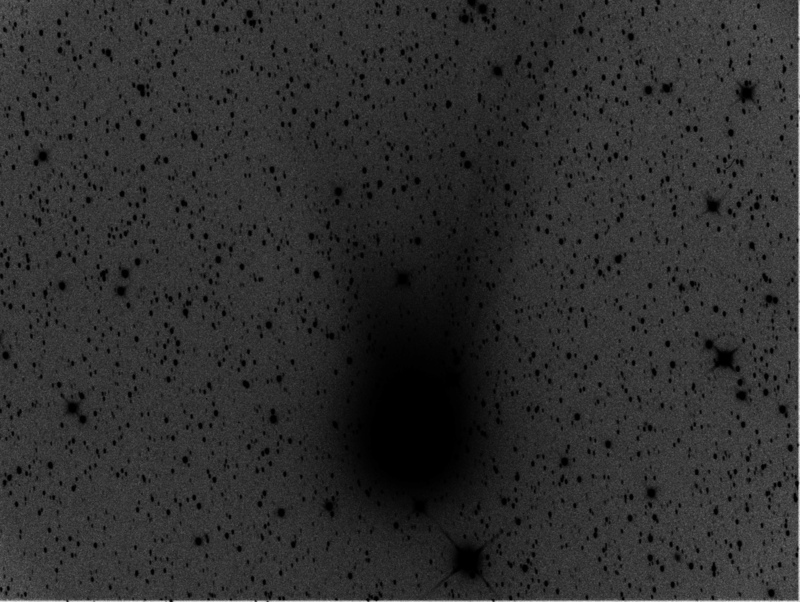 Image from January 31, 20012 between 04:41:19 and 05:19:49 UT. The sky was not as transparent as I had hoped. Notice how the ion tail is much thinner compared to the previous time. 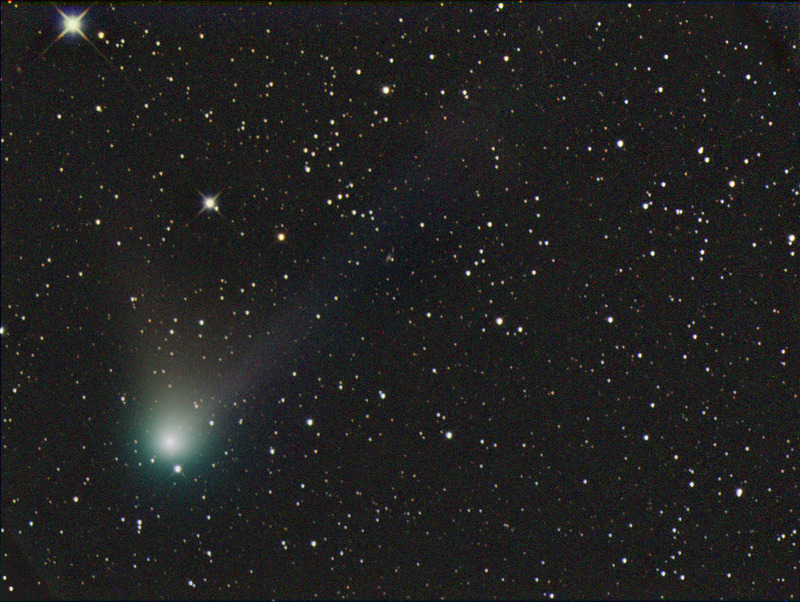 6 x 5 minutes exposure between 04:15:48 and 04:46:56 UT on January 24, 2012. 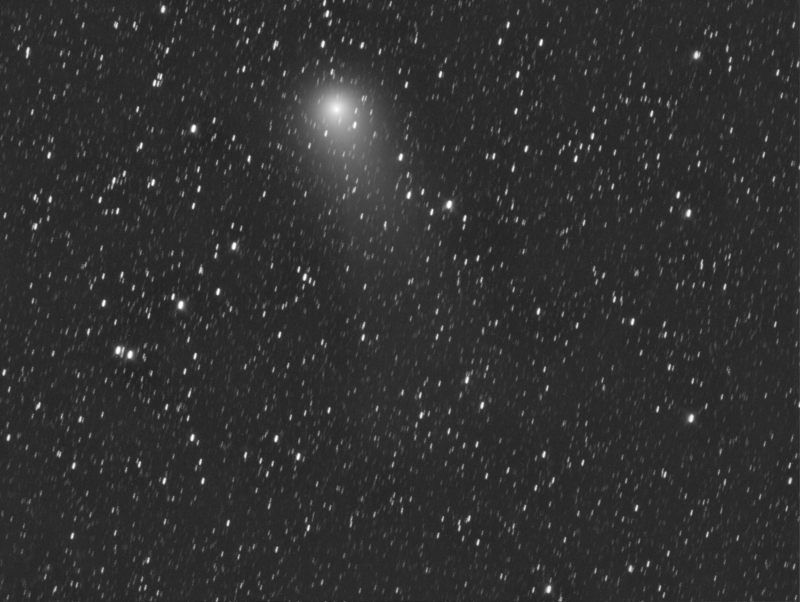 40cm f/4 newton, QSI583wsg in binning 2x2. I read a sky brightness of 20,6 on the SQM. 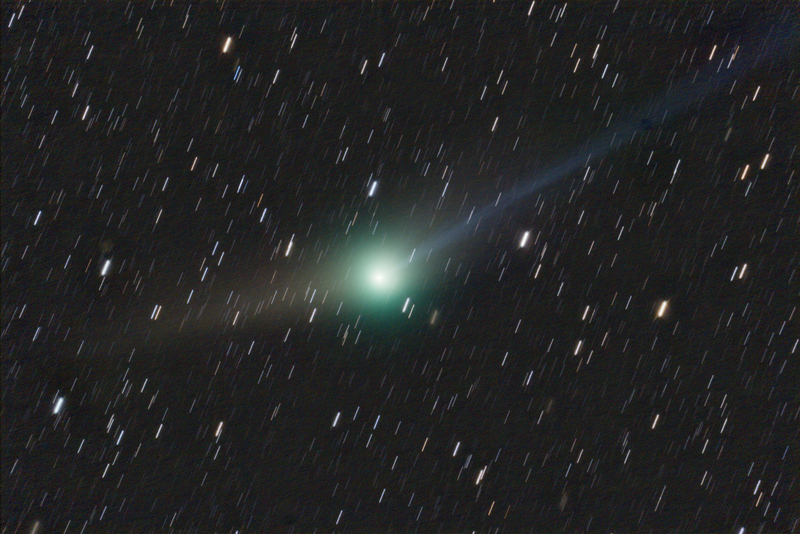 Last image of this comet in the evening sky, it has sunk into the trees now from my location! SQM reading was mag 19.45 /square arcsecond due to nearby Sportfield illumination and a watery sky. 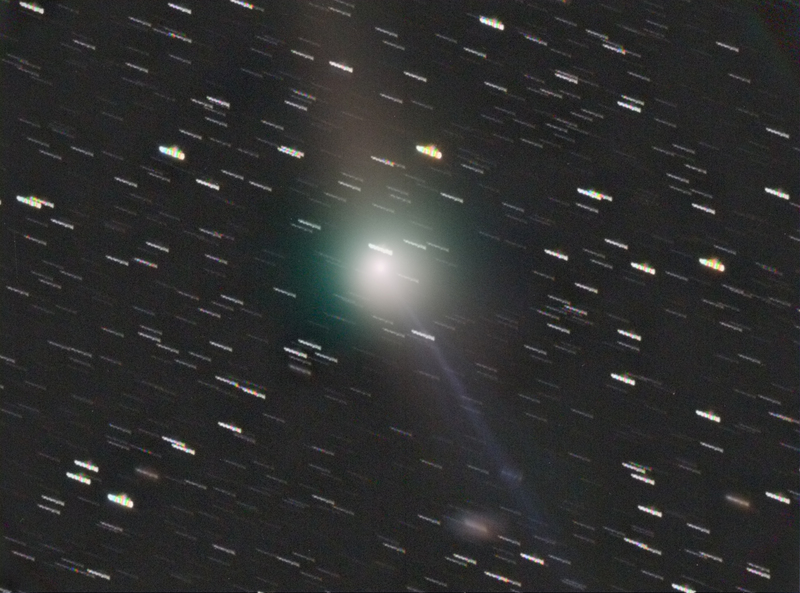 All RGB data was added and used as the Luminance. I'm quiet pleased with the result considering the circumstances! 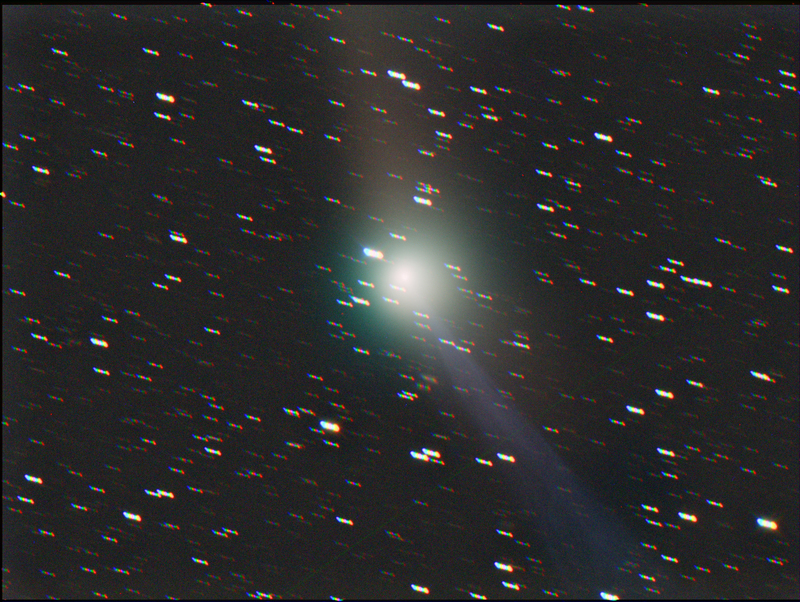 2011-10-23 17:44:58 UT - 18:47:28 UT 40cm F/4 with QSI583wsg @ -20°C 4 x 300s each for RGB, combined with adaptive add and colourprocessed in PixInsight. 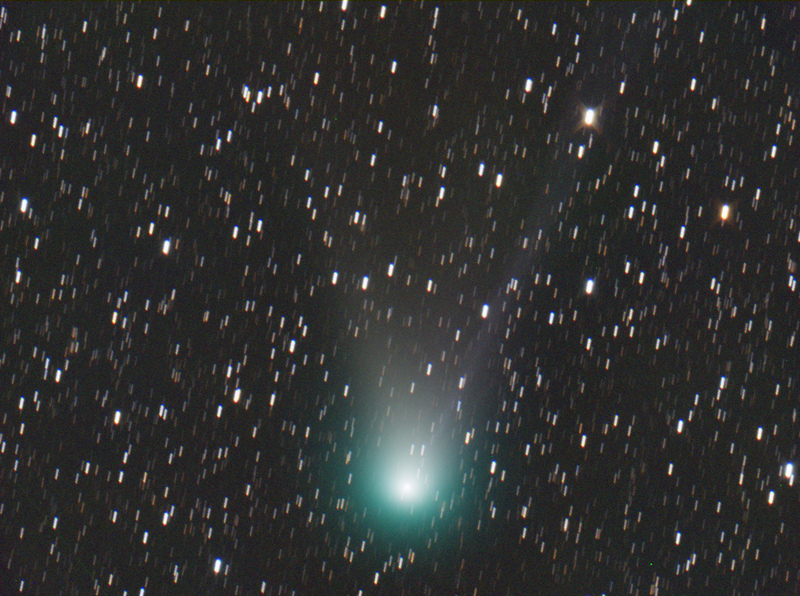 2011-10-23 17:44:58 UT - 18:47:28 UT 40cm F/4 with QSI583wsg @ -20°C 4 x 300s each for RGB, all calibrated images added with adaptive add. 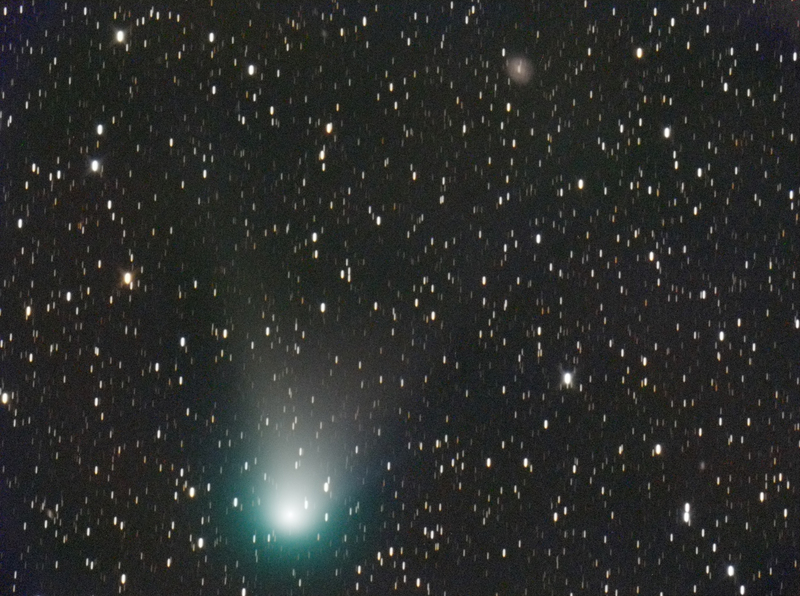 A little less moonlight today, a few galaxies are visible below the comet. 10 Luminance exposures of 2 minutes each between 20:01:00 and 20:11:00 UT on September 15, 2011, Despite the Full Moon there is some tail visible.